Optimal time to repot is rapidly coming to an end as days get shorter. Repotted orchids need time to grow new roots into the medium so that they can acquire water and nutrients during winter and early spring. Always remember that plants are “cold blooded”, which means only that their growth is entirely determined by temperature. Each orchid can survive within some temperature range, but within that range is an optimal temperature range where it grows fastest because it can take up nutrients and water at a rate sufficient for it to use all of the light it is getting and move water to its leaves fast enough to keep its leaves cool while it absorbs sunlight. At higher temperatures an orchid may not be able to keep its leaves cool enough to prevent burning and at lower temperature it may not be able to obtain nutrients fast enough to turn light into new tissue. 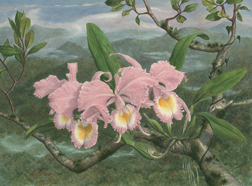 The ideal temperature range for most orchids was determined by the natural environment of an orchid’s ancestors. This may be easy to determine for a species, but more difficult for hybrids. Hybrids, however, have been selected for best growth at typical greenhouse temperatures. Vandas, whose ancestors are from the lowlands of the tropics, continue to grow at high temperatures that would inhibit phrags which come from the Andes. Most hobbyists pay attention to the temperature in their growing area. That, however, in not exactly what your orchids experience. Direct sunlight on a plant leaf warms the interior of the leaf far above the air temperature. If there is no air movement around the leaf or the orchids cannot obtain enough water to cool its leaves through transpiration then an orchid leaf can quickly burn even though the air temperature is below the maximum temperature recommended. Conversely, lots of air movement can allow an orchid to survive in an environment where air temperature is far above what is recommended. The temperature within the orchid pot is another important facet for orchid growth. Typically, the temperature within an orchid pot is different from the air temperature; cooler during the day and warmer at night. The temperature within the pot determines the rate of root growth, nutrient uptake, decomposition of the medium, etc. In winter, a dark pot will absorb heat and roots remain well above the ambient air temperature at night. A soil temperature probe is ideal for understanding growth of orchids because it indicates what is happening in the pot. Hobbyists often note that root growth in Vandas cease much earlier in the fall than other groups of orchids. To some degree, this occurs because we generally grow Vandas in baskets where root temperature is at or near that of the air. White plastic pots in a greenhouse remain much cooler than dark green pots even when there seems to be little direct light on the pot. Most surprising is the temperature within clear plastic pots. These act like little greenhouses and warm up quickly. A clear, plastic pot with medium exposed to direct sunlight can warm to well over 100 F in a matter of 15 minutes, while a white or even green pot remains below 90 F. This can be a problem in summer, but ideal in winter when air temperature is low and days short. Phalaenopsis mericlones grown side by side in clear and white pots with open their first flowers a week or so apart simply because of the difference in medium temperature produced by different types of pots. This heat gain is most extreme when the medium is dry as the water in a wet medium absorbs large quantities of heat. Many successful hobbyists who live in environments that are not idea for orchids take advantage of the different characteristics of pots and use it to mediate temperature extremes. Clay pots tend to be cooler than plastic in summer. Water evaporates from the exterior of the pot cooling the pot and its roots. Water is pulled continuously from the medium through the pot as long as the medium is wet. This works extremely well to cool orchids in hot climates during summer as long as there is lots of air movement and a supply of good water. The quality of water is critical since water is continuously evaporated from the surface of the pot and any dissolved salts are deposited on the pot surface. If water quality is poor, i.e. lots of stuff in the water, a silver or grey sheen will develop on the pot surface that limits water movement through the pot. This salt buildup can become so severe that roots die when they come in contact with the pot. Fertilizer dissolved in de-ionized or rainwater can produce the same effect unless there is a sustained effort to flush pots. Pots can become so filled with a surface glaze of salt that water no longer moves from inside to outside a pot. In fact, salts can move back into the clay pot and make even the interior surface toxic to orchid roots. Hobbyists who use water high in dissolved solids are well advised to discard clay pots and not reuse them. Many arid areas in the U.S. have water with lots of dissolved solids. This combined with low humidity and high temperature leads to clay pots with lots of surface salts.